We’d love your help. Let us know what’s wrong with this preview of Santa Claus Is for Real by Charles Edward Hall. Every year, over a million people attend the Radio City Christmas Spectacular, where they have the pleasure of seeing Charles Edward Hall don a traditional red suit and become the world's most famous Santa Claus—a role he has p A heartwarming true-life fable from the Radio City Christmas Spectacular Santa—including his personal journey of discovering the magic of Christmas. To ask other readers questions about Santa Claus Is for Real, please sign up. Santa Claus is for Real is a truly magical journey that Charles Edward Hall takes us on. This is also his journey as he narrates the audiobook and it was perfect! Hall has been Santa at the Radio City Christmas Spectacular since 1987. As children, we see the magic of Christmas which includes Santa. There is just something about that man with the long white beard and red outfit that fascinates children. As adults we become busy in our everyday lives and we can forget how special this time of year can be. This has been a difficult year and it just did not feel like Christmastime for me. Then I listened to this audiobook and it changed everything! It was the perfect read for me and I found the Christmas spirit. Everyone needs to read this book or listen to the audio version. We all need to believe in Santa Claus. Thank you Charles Edward Hall for your story and I would love to one day be able to go to NYC at Christmas time. you're gonna have to trust me on this one: the older you are the less you will believe the title of this book. read it anyway. seriously. deserves all five stars and more! by reading this book you will regain the essence of your child's heart or not. i did. happily so. really and truly. A light read and very enjoyable as his biography is written like fiction. I love this book because this book taught me how to believe in myself. I have nothing to say! Everything wonderful, magical, unexplainable, awesome, compassionate, loving, everything about Santa is in this book! I laughed, I cried, I believed! A truly amazing book!! This has become one of my all-time favorite books. It has become tradition for me to listen to the audiobook every November. If you don’t believe in Santa Claus, then I guarantee you will by the end of this book. I still believe in Santa and Christmas is my very favorite time of year. Mr. Hall managed to I have nothing to say! Everything wonderful, magical, unexplainable, awesome, compassionate, loving, everything about Santa is in this book! I laughed, I cried, I believed! A truly amazing book!! You never know when a book will catch your attention or literally jump off the shelf calling you name to either browse through it or buy it. Well that is exactly what happened to me. I have always believed in Santa Claus and his magic and his mystique. When I read this book I found in my heart that I had lost the magic not necessarily in Christmas love I have over the years for various reasons. When I read this book I just didn't think it was about Santa Claus and his Christmas magic in my opinio You never know when a book will catch your attention or literally jump off the shelf calling you name to either browse through it or buy it. Well that is exactly what happened to me. I have always believed in Santa Claus and his magic and his mystique. When I read this book I found in my heart that I had lost the magic not necessarily in Christmas love I have over the years for various reasons. When I read this book I just didn't think it was about Santa Claus and his Christmas magic in my opinion for me it was a sign once again that it has a spiritual connotation for me. Because I could see the transformation that happened to Charlie in the story and that is what is what is happening in my life. I had a every traumatic event that literally change my childhood forever that no child should ever have to go through but when I read this book it gave me hope that I will find my spirit filled with joy and wonder again since I am working really hard to heal that little kid in me again like a child anticipating Christmas Eve. Charlie did start out as Scrooge in the play but when he eventually played Santa his heart melted and he became the person who he was suppose to be a kind hearted, caring person and realize that he could once again embrace Christmas like he did when he was 6 years old. This book is amazing for those who really read between the lines. What a wonderful memoir by the man who has played Santa Claus in the Radio City Christmas Spectacular for the past 30 years. It is a relatively short and easy read, starting as a boy who believed in Santa and the magic of Christmas back in Kentucky. He later moved to New York City to become an actor and lost that magic and spirit of Christmas until he was cast as both Scrooge and Santa in Radio City's newest musical, "Radio City Christmas Spectacular" and recaptured all that mystical Christmas s What a wonderful memoir by the man who has played Santa Claus in the Radio City Christmas Spectacular for the past 30 years. It is a relatively short and easy read, starting as a boy who believed in Santa and the magic of Christmas back in Kentucky. He later moved to New York City to become an actor and lost that magic and spirit of Christmas until he was cast as both Scrooge and Santa in Radio City's newest musical, "Radio City Christmas Spectacular" and recaptured all that mystical Christmas spirit. This book is a great read to get oneself prepared for the often frenetic Christmas season and reminds us, to always believe in the magic of Christmas and Santa. I received this free as an ARC through NetGalley from the publisher in exchange for an honest review. This was a gift... from my husband for Christmas this year. He knows me so well. The tears found within these pages are a mix of happy and sad. I've seen Mr Hall perform as Santa both live and on my DVD of the 75th Christmas Spectacular, he truly embodies the spirit of Santa Claus. I savored each and every page. Reading his story made me fall even more in love with man, both Santa and Mr Hall. 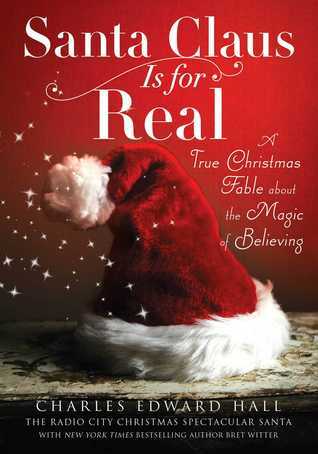 Anyone who loves Santa and Christmas should read "Santa Claus is for Real." I had no idea what to expect. Not even sure how it ended up in my audible library, but I LOVED this book!! It's the perfect story to kick off the Christmas season, and safe for all ages. I highly recommend the audio version as I don't think I could even imagine a Santa Claus, this great. It's not too long yet packed with details that immerse you in the magic of Christmas. I might read it, every Christmas. Truly enjoyed Hall's personal journey to find the real spirit of Christmas. The peek into life behind the scenes at the Radio City Music Hall Spectacular was also interesting. An enjoyable read for the season and for my memoir kick. What a fun book about one young man's journey to believing! Heartwarming and inspirational. We all have a bit of Santa Claus in us, we just need to believe and keep working to stay on the nice list! Makes me want to head to NYC and see the show. I enjoyed reading this book of the true story of the gentleman who played Santa for the Rockettes. He tells of growing up and losing his faith. Life events turned him around and made him a true believer. This book was absolutely magical! It is the definition of "believing is seeing" I am Christmas crazy person, but I also am so in love with it for the pure heart of the season (think hallmark movies) and this book proved everything that is important about the holidays! This was a fun, uplifting book. I really enjoyed it. A perfect holiday read! Thank you to NetGalley and Gallery, Threshold, Pocket Books for providing me with an ARC in exchange for an honest review. I really enjoyed this book. It was a heartwarming story and perfect read to get into the Christmas spirit. I found this book after seeing the Radio City Christmas Spectacular so maybe that's why there was an extra enjoyment to it. I do recommend this book. 194 pages taking a little over an hour to read. Cute Christmas book about Charles Edward Hall who has played Santa at the Radio City Music Hall Christmas Spectacular for 28 years. Cute,heart warming and funny Christmas story. While a good holiday story, especially for little ears, this is a bit unbelievable for adults. AND it's labeled a "true Christmas fable"... okay. Isn't that a bit contradictory?